I need more space in the spare bedroom for an office. The twin bed and armoire had to go and be replaced by a Murphy bed. Have you priced those things? Not inexpensive. So my trusty husband, Steve, said that he could build one. We ordered the special hardware from Create-A-Bed and luckily the bed plans came with it. Instructions state clearly that you MUST NOT DEVIATE FROM THE PLANS!!! He didn't. Every new project seems to require a great power tool. We bought a 30 gallon air compressor and a Husky Pro Paint Sprayer and I used it to paint the bed. More on that later. It was an interesting experience. I bought a mattress that will be delivered this evening. Other than swooning over the price tag that wasn't a chore. 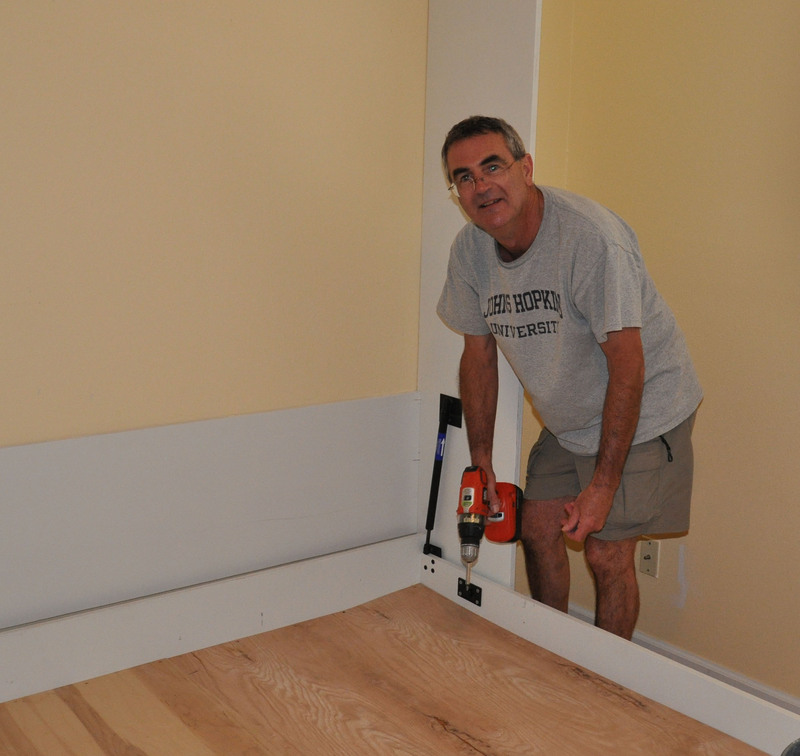 Steve is going to build shelves for either side of the bed which will also require painting. We are having a seriously busy summer but by the fall our house should be back to normal and, God willing, my mom and sister's house will be perfect and they will be in it! Those are wonderful beds for occasional use, and yes, they cost the moon. Kudos to Steve for bravely building it himself, and to you for painting! Wow, he is willing to tackle most anything…and he’s successful…lucky you! And you get right in too…I am impressed! These are wonderful – my DH built in one, and I finished it as well, with oak stain and varnish! We decided to put two small halogen lights in the top of ours as there is no room for a bedside light. Just a thought. It looks great, and others guests say it sleeps great, too. Wow, My aunt & uncle in Florida had one of those. Slept on it many a night when I was a kid. We have one in my sewing room/office/guest room and it is quite comfortable. We also have one in a rental unit that is not. I hear (cant vouch for the veracity of this, though) that Murphy bed mattresses are specially designed to be stored “on end”, and that “regular” mattresses will “slump” over time. Becky, I need your secret–how do you manage to do all the traveling you do, make all the quilts you do, AND still do all those home projects? Hi Becky— I have the idea that Steve, other than being multi-talented, will take on new projects so he can add to his treasury of power tools. What a terrific project. 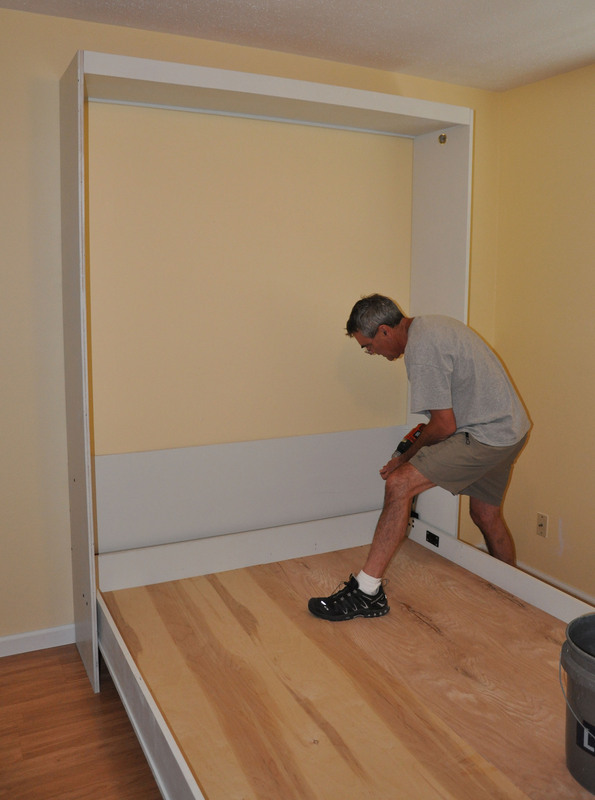 I once rented an apartment with a Murphy bed. Loved it–made room straightening a breeze. What’s next? You know, I dont rest. To be honest Im too busy right now but theres not much way around it. Since Ive prioritized my to do list (read back a few days/weeks) I at least feel more in control of my life. But its not easy. I hope that once moms house is done and she and Christy are in it, things will smooth out. I’ve scraped MILES of popcorn ceiling. get a sprayer (not just a bottle) and spray it down with water about a 12′ square section at a time, let it sit about 10 minutes and then it just “slides” off with a wide putty/spackle knife. I found that holding a large garbage can lid in one hand, while you scrape with the other catches any mess and then you just toss it out when the lid gets too full. I did about 1200 square feet in an afternoon by myself. Thanks for the tips. Ive done this before but I think I tried to soak too much at a time. Ill go with more water in less area, faster.